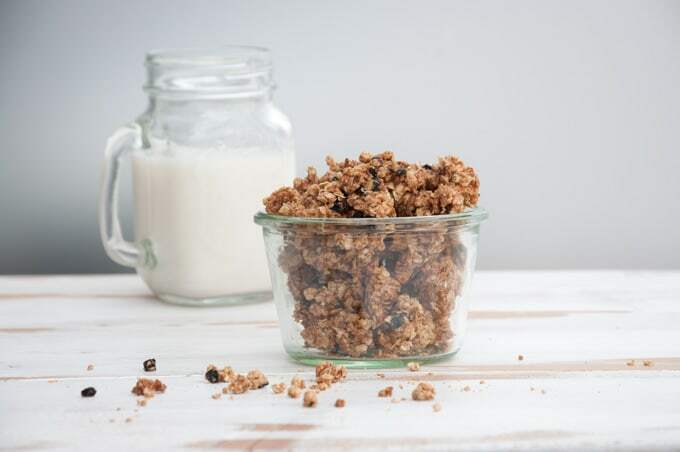 Recipe for a homemade, crunchy Marzipan Granola with dried blueberries – made with only 4 ingredients! Delicious in plant-based milk, yoghurt, on nice cream or to simply snack on its own! I only discovered recently the joys of homemade granola. But why does this have to be so delicious?! I’ve never had granola in a bowl of (plant-based, duh) milk, because I always end up snacking it on its own before I get a chance. 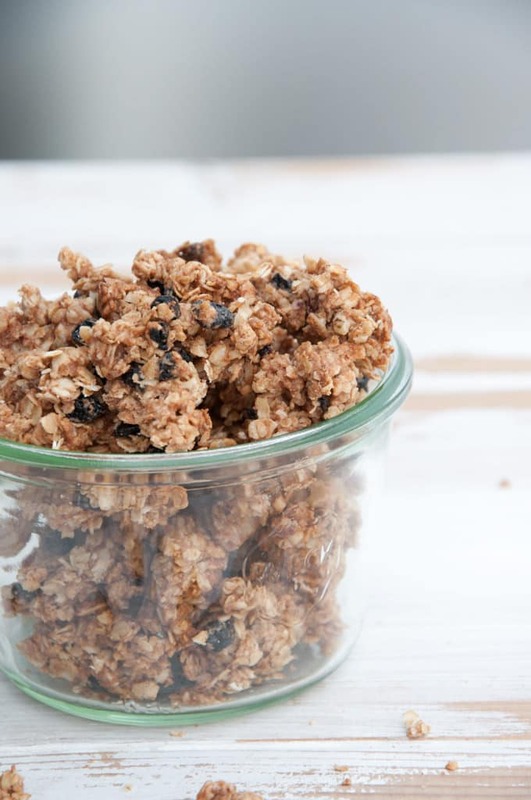 Due to the almond butter used in the recipe, you won’t need any oil to make this granola! And since we know that almond butter and maple syrup or rice syrup go so well together, I figured I’d have to make a granola with this flavor: A Marzipan Granola. 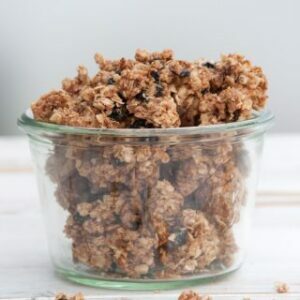 Recipe for a homemade, crunchy Marzipan Granola with dried blueberries - made with only 4 ingredients! Delicious in plant-based milk, yogurt, on nice cream or to simply snack on its own! Pre-heat the oven to 360°F/180°C. In a mixing bowl, add the almond butter and maple syrup and give it a good mix. Add in the rolled oats and dried blueberries and mix again until clumpy. Place the mixture on a baking sheet lined with parchment paper and spread it so it’s about 1 inch thick. Bake it in the oven for about 10 to 15 minutes. Let it cool off completely before breaking it in chunks and using it in your breakfast e.g. with vegan milk, yoghurt or on nice cream. Enjoy! To store it, keep it in an air-tight jar and store it at room temperature. 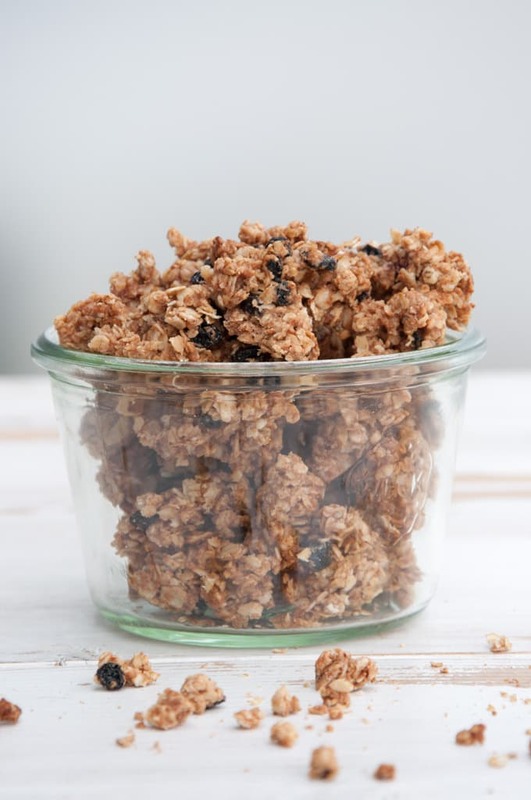 *Oats: Use certified gluten-free oats if you want to make the granola gluten-free. 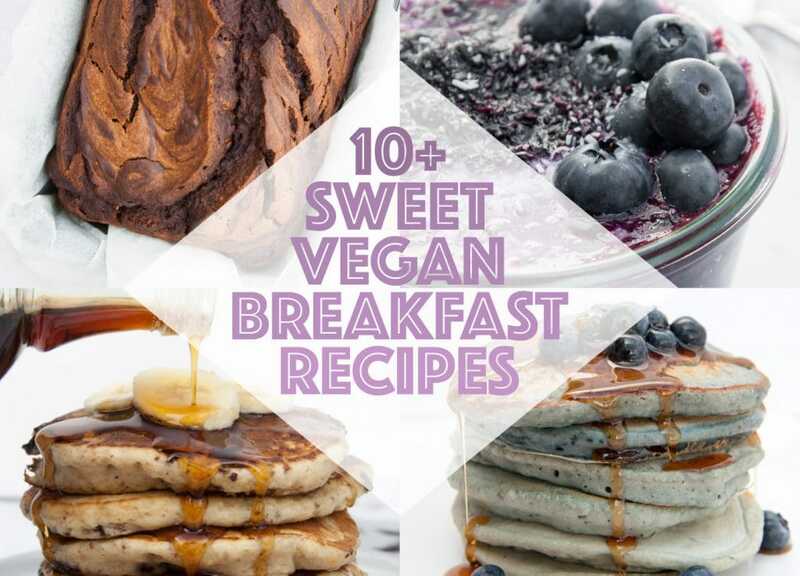 Previous Post: « 10+ Vegan Jackfruit Recipes You’ll Love! You only JUST discovered it? What have you been waiting for!! Granola making is the greatest! Thank you Natalie! Isn’t warm, fresh-out-of-the-oven granola-snacking the best? !